After joining forces on multiple occasions to fend off the ongoing threat of Killer Kross and Moose, Johnny Impact ended up turning on his friend Brian Cage last night. Kross had Impact set up with a cinder block by his head on last week's episode. Taya Valkyrie dragged Cage out to help him, but he stood by, feeling he had helped the champion out enough. After Valkyrie stood up to the psychotic Kross, Cage finally intervened. However, it was all a ruse, as Valkyrie dropped Cage with a low blow before Impact drove the cinder block into his head with a chair. Was Killer Kross apart of the scheme? Johnny Impact and Taya Valkyrie explain their actions tonight. IMPACT kicks off in ONE HOUR and you can get the hype started with the opening video! 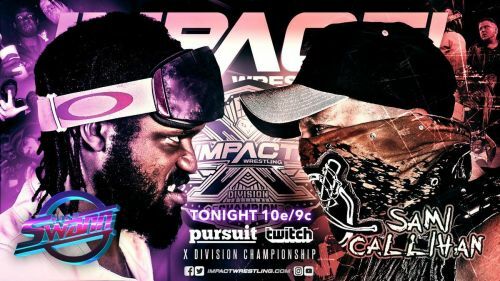 Also, we'll see the war between Sami Callihan and Rich Swann continue as the Draw looks to steal the X-Division Championship away from his former brother. With Swann finally giving Callihan a strong no to joining oVe, Callihan begins his plan to ruin his life tonight. All that and more on Impact Wrestling. Trey took to the legs of Moose early, looking to chop him down. Moose took a facebuster but blocked a hurricanrana. Trey sped around the former Grand Champion, and though he caught a forearm from the former NFL player, he managed to shake it off and connect with several suicide dives. Trey went at him with a plancha, but Moose caught him and launched him into the apron with a powerbomb. At the eight count, Moose prevented the ref from finishing the count, then went outside to dish out some more punishment. He looked for another powerbomb on the floor but Trey stuck to the ropes and connected with a superkick. Trey went for a hurricanrana through the ropes after a 619 fake out, but Moose stopped it, swinging him into the steel steps. Moose rolled him back inside and taunted the crowd before pelting him with punches. A nonchalant cover allowed Trey to kick out. Moose set him up in the corner and connected with a running elbow. Trey countered the next two attempts with kicks and rolled him up out of an attempted third powerbomb from Moose. Moose broke out and levelled Trey with a decapitating clotheseline. In the corner, Moose went for a superplex. Trey trapped Moose in the apron and connected with a superkick. Multiple strikes from Trey left Moose hurting, and a missile dropkick from the top sent him outside. This time around, the somersault plancha connected. Trey went up top for the frog splash and hit it, but Moose kicked out at one. Trey ran in only to crash to the mat after a pop up powerbomb. The crowd chanted for him as he kicked out of the cover. Moose picked him up by the jaw, but as he went for a discus lariat, he was rocked by another superkick. Trey avoided another lariat with a Pele kick and spiked him with a reverse hurricanrana followed by a double stomp to a kneeling Moose's head. As Moose recovered, Trey went up top once again. Moose avoided and blocked a Codebreaker attempt. After launching him into the ring post twice, he mowed Trey down with the spear for the win. 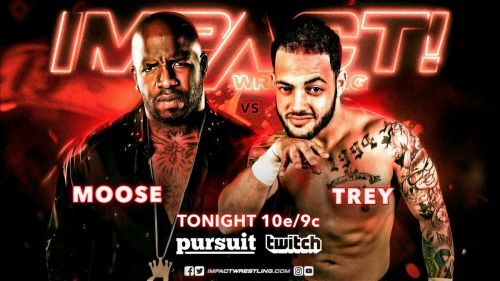 Results: Moose defeated Trey via pinfall. A pre-recorded message from oVe played after the match. Sami Callihan said that Rich Swann turned down the opportunity to have a family. Tonight, he'll have to handle Callihan by himself as oVe will "handle Willie Mack." Tonight, the Draw was walking out as X-Division Champion, and oVe is taking over everything.